Suzann Pettersen made it a memorable comeback to Columbia Edgewater Country Club for the LPGA Tour’s Safeway Classic Presented by Coca Cola. Not even a double-bogey at the par-3 second hole could slow down Pettersen as she fired a final-round 5-under 67 to take home her second Safeway Classic. Pettersen pulled away from a star-studded leaderboard at Columbia Edgewater Country Club and finished at 20-under par to clinch her 12th LPGA Tour career victory. She finished two shots ahead of American and No. 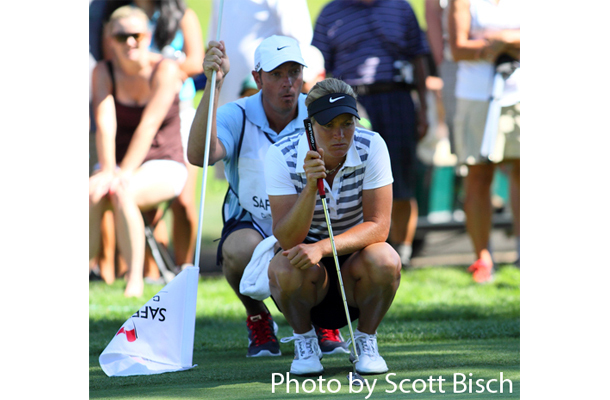 2 ranked Stacy Lewis who shot a 4-under 65 and didn’t record a bogey through all 72 holes. The event returned to Columbia Edgewater Country Club after four years at Pumpkin Ridge’s Ghost Creek Golf Club. Pacific Northwest players Paige Mackenzie of Yakima finished tied for 23 at 10 under while Wendy Ward of Edwall, Wash., near Spokane, tied for 54th at four under. Pettersen’s start did not look promising after she and playing partner and third-round leader Yani Tseng both double bogeyed the par 3 second hole. But Pettersen said her goal was to keep her emotions in check and did just that by carding five birdies in the next six holes after the double. The Norwegian picked up three more birdies on Nos. 10, 11 and 13 to reach 21-under and extended her lead to three shots. She said she didn’t have any idea where she stood on the leaderboard with just three holes to play.